For the first three quarters of 2017, the property/casualty industry’s financial results were profitable, but bore the effects of sharply higher catastrophe claims, compared to the comparable period for 2016. The property/casualty industry’s financial results for the first three quarters of 2017 were profitable, but bore the effects of sharply higher catastrophe claims, compared to the comparable period for 2016—itself generally a down period versus 2015. 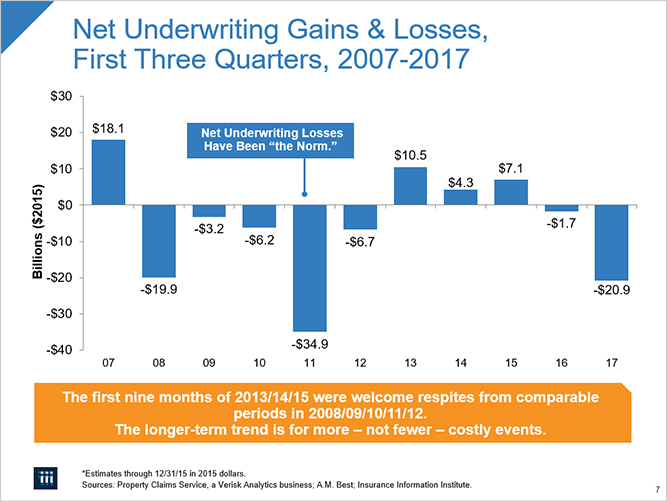 Large underwriting losses this year followed smaller underwriting losses last year; and net investment gains were about the same as last year (after adjusting for a large one-off gain by a single company), leading to profits (including that one-off gain) of $22.4 billion vs. $32.1 billion for last year’s first three quarters (Figure 1). The industry’s overall profit and its underwriting performance in the first three quarters of 2017 produced the second-worst nine-month profit result since end of the Great Recession. This latest performance translates to a rate of return on average surplus of 4.2 percent (it was 6.3 percent in the comparable year-earlier period). Although these data do not include the fourth quarter of 2017, the final quarter is unlikely to brighten the picture, with claims from California wildfires and the typical fourth-quarter slowdown in premium growth yet to come. 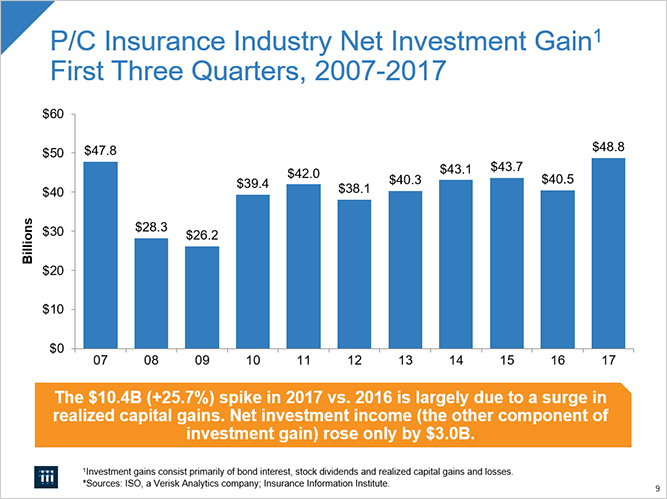 One bright note: at the end of the first three quarters of 2017, overall industry capacity (as measured by policyholders’ surplus—what in other industries would be called net worth) reached an all-time high of $719.4 billion (Figure 2), driven largely by unrealized capital gains and despite the large volume of claims from hurricanes and other catastrophes. 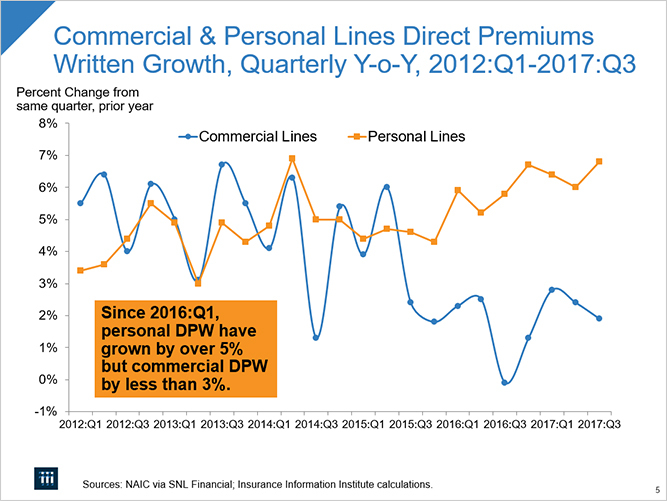 Net written premiums in the first three quarters of 2017 grew by $16.7 billion (4.1 percent); in the comparable period in 2016 they grew by $11.0 billion (2.8 percent) (Figure 3). 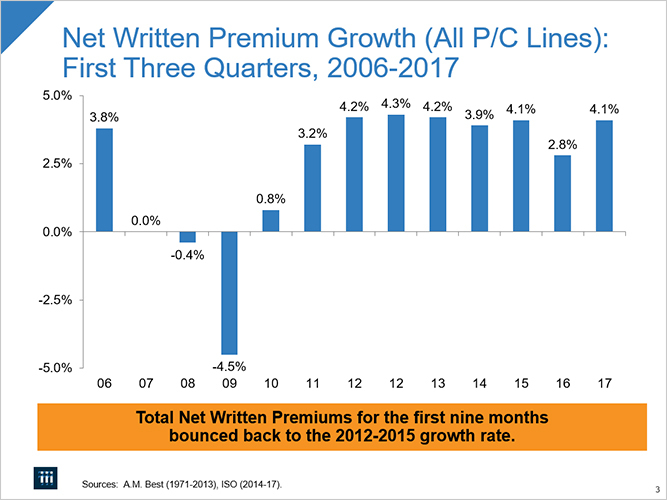 As Figure 3 shows, a 4.1 percent rate of net written premium growth is what the industry has posted consistently (except 2016) every year since 2012. 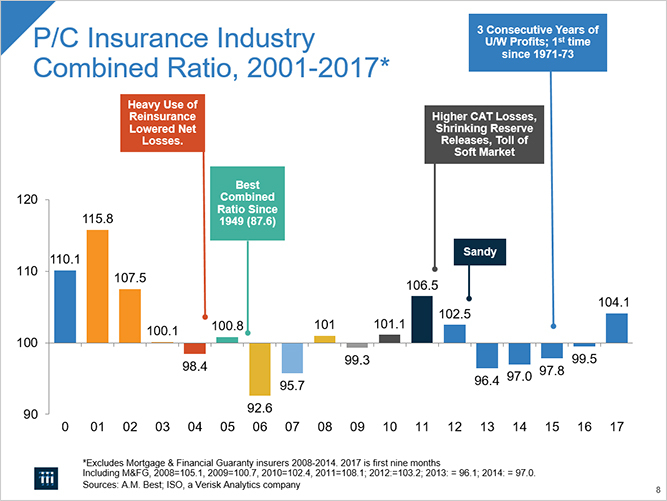 There are two main drivers of premium growth in the property/casualty insurance industry: exposure growth and rate activity. Overall economic growth in the middle of 2017 was stronger than expected at this stage of recovery from the Great Recession: real (inflation-adjusted) GDP rose at a rare 3.1% annual rate in the second quarter of 2017 and 3.2 percent in the third quarter, when it had been running at the mid-2-percents in the prior nine quarters. The big question now is whether the just-enacted tax cut and/or a pickup in productivity growth will keep the economy growing at a 3+ percent annual pace or return to the 2.4 percent pace that has been more typical of the post Great Recession period. There are sound economic reasons supporting each of these outlooks. As is often the case, in 2017 some sectors did better than others. For example, regarding commercial activity, 2017 was the best year ever for U.S. intermodal (rail containers and trailers) units, up 3.9 percent over 2017 (and up 2.2 percent over 2015—the previous record). Also, regarding personal lines, 2017 is on pace to be the third year in a row of over 17 million new cars purchased. And even if old cars are being replaced only one-for-one, the new cars represent higher value and possibly additional coverage (since they likely include comprehensive and collision insurance, whereas older cars tend not to have these coverages). This bodes well for premium growth in auto insurance. 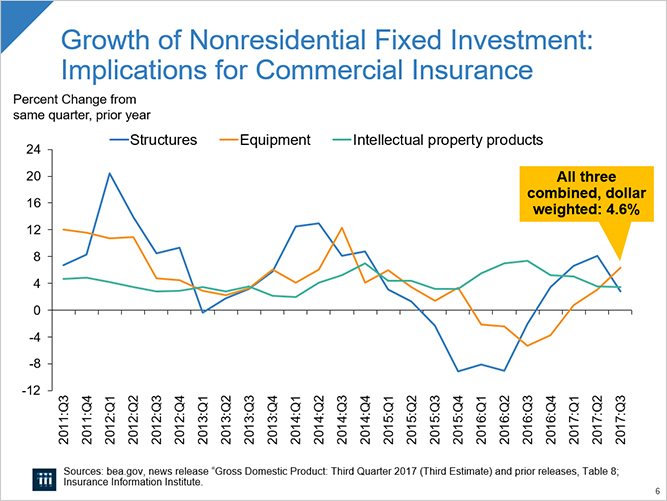 Exposure growth in other key areas of the economy included continued growth in residential construction and business fixed investment (in structures, equipment, and software) (Figure 5), and consistent employment and payroll growth. Continuing growth in the number of people employed throughout the U.S. economy in 2017 also constitutes exposure growth and therefore affected P/C insurance premium growth. Job growth lifts exposures in the entire economy, of course, but the expansion of payrolls affects workers compensation premiums in particular. The United States economy added 1.9 million nonfarm jobs from the end of the third quarter of 2016 through the third quarter of 2017—the seventh straight such third-quarter-to-third-quarter period of job growth at least this strong. Preliminary data show even stronger job growth in the fourth quarter of 2017, and the corporate tax cuts enacted at the end of December 2017 suggest the possibility of continued robust employment growth in 2018. Combined with slightly-above-inflation increases in pay (as has been the case for the past few years), payrolls are expected to continue growing, resulting in an expectation of billions of dollars in new premiums written by workers compensation insurers in 2018. 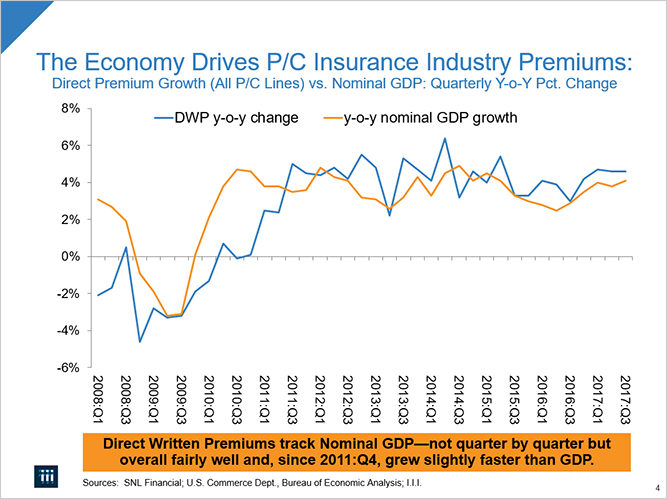 The other important element in industry premium growth is rate activity. Rates tend to be driven by trends in four areas: claims costs; conditions in the reinsurance market; underwriting, marketing and distribution costs; and investments in technology, among other factors. In the first three quarters of 2017 claims costs were $311.6 billion, up by $31.7 billion (+11.7 percent) vs. $279.9 billion in the comparable period in 2016. Compared to 2016, the industry experienced increases in both catastrophe-related claims and non-catastrophe claims. Because the three major CATs in the 2017 third quarter occurred so close in time to each other and were so large, many claims from those events haven’t been closed as of this writing, so we cannot report with finality what the impact of CAT claims was in the first nine months of 2017. ISO/PCI estimates the 2017 9-month total of catastrophe-related losses and loss-adjustment expenses at between $36 billion and $40 billion. Non-CAT claims also rose but not as sharply--up by $12.7 billion (+4.9 percent), from $261.1 billion to $273.7 billion. These numbers are net of reinsurance recoveries and reserve releases (see below) and include loss-adjustment expenses. The trend in insured losses for private passenger and commercial auto has been for both increased severity (a long-term trend) and increased frequency (a last-two-years trend), as discussed in the I.I.I. white paper Personal Automobile Insurance: More Accidents, Larger Claims Drive Costs Higher (available on www.iii.org). More auto crashes result from a number of coincident forces, including more drivers on the road, particularly at rush hour (10 million more people employed in the last four years), bad weather, and distracted driving. There is evidence that insurers have been working on expense control. Underwriting and operational expenses grew by $1.6 billion, up 1.4 percent in the first nine months of 2017 compared to 2016. Although it is not as easy to measure productivity in P/C insurance as it is in, say, manufacturing, it is noteworthy that property-casualty insurers employed only 9,000 more people (not seasonally adjusted) at the end of the first nine months of 2017 than at the comparable point in 2016—an increase of only 2.7 percent. The industry’s overall underwriting loss for the first three quarters of 2017 was $20.9 billion. A common measure of the results of insurance operations is the combined ratio. This ratio is the sum of three percentages: claims and claims-adjustment expenses as percent of earned premiums, other expenses as a percent of written premiums, and policyholder dividends as percent of earned premiums. Therefore, the combined ratio can change because of changes in any of the three elements, but it’s usually the first one that has the greatest impact, as in 2017. The jump in claims costs, referred to above, drove the all-lines combined ratio to 104.1 for the first three quarters of 2017. (Figure 7). (Figure 8). These days, with investment income below levels that would be produced if interest rates were at historical levels, P/C companies generally need to achieve combined ratios below 95 in order to earn their cost of capital in a still challenging interest rate environment. On the investment side, the industry numbers don’t helpfully depict the results for the entire P/C industry. For the first three quarters of 2017, the industry’s net investment gains (which include net investment income plus realized capital gains and losses) rose sharply vs. the year-earlier period, from $38.8 billion to $48.8 billion (up 25.8 percent) (Figure 9). Virtually all of the increase came not from investment income but from realized capital gains ($13.4 billion in 2017’s first nine months, vs. $5.6 billion in the comparable 2016 period) (Figure 10). But a large part of that $13.4 billion increase came from one $9.1 billion transaction by one insurer. Without that one transaction, realized capital gains for the industry were $4.3 billion in 2017, down $1.3 billion (23.2 percent) vs. 2016. Net investment income has basically two elements: interest payments from bonds and dividends from stock. The industry’s net investment income for the first three quarters of 2017 was $35.4 billion, up by 5.2 percent from $33.2 billion in the first three quarters of 2016. Most of this income comes from the industry’s bond investments, which are mainly high quality corporate and municipal bonds. Corporate bond market yields, as captured by Moody’s AAA-rated seasoned bond index, averaged 3.95 percent in 2017:Q1, dropped to 3.8 percent in April and May then sank again, averaging 3.7 percent in June and July, and dropping to 3.6 percent in August through October. We focus on long-term corporate interest rate yields because those are the type of assets in which P/C insurers mainly invest. Lower rates can have two effects on the financial status of property/casualty insurance companies—both negative. In general, lower yields mean lower investment income and a lower discount rate applied to “long-tail” reserves, which results in raising reserves for future claim payments. Lower prevailing yields also imply higher asset values for bonds with higher coupons, but if those investments are being held for maturity, insurance accounting rules don’t reflect those higher asset values. Nevertheless, even if long-term corporate bond yields trend upward in 2018, funds from maturing bonds will likely be reinvested at rates that are likely to be lower than, or at best only slightly higher than, the yields of prior investments—especially those made in 2011 or earlier. 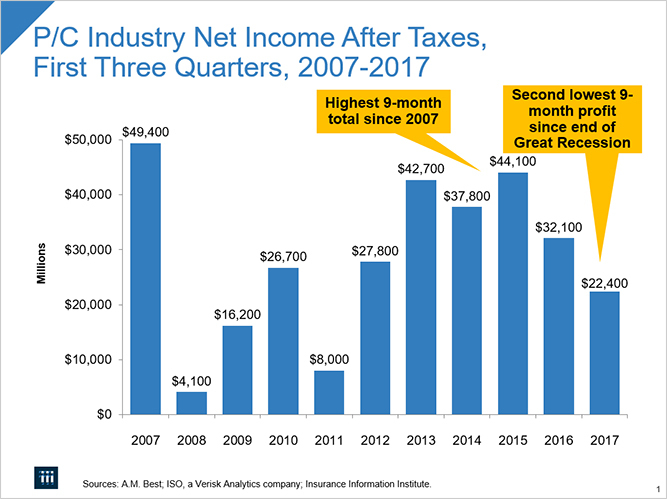 The other significant source of net investment income (besides bond yields) is stock dividends, which were essentially flat during the first three quarters of 2017 (but 2.3 percent higher than for the first three quarters of 2016). Stock holdings in general represent roughly 23 percent of the industry’s invested assets, up from 21 percent at the end of the third quarter of 2016. 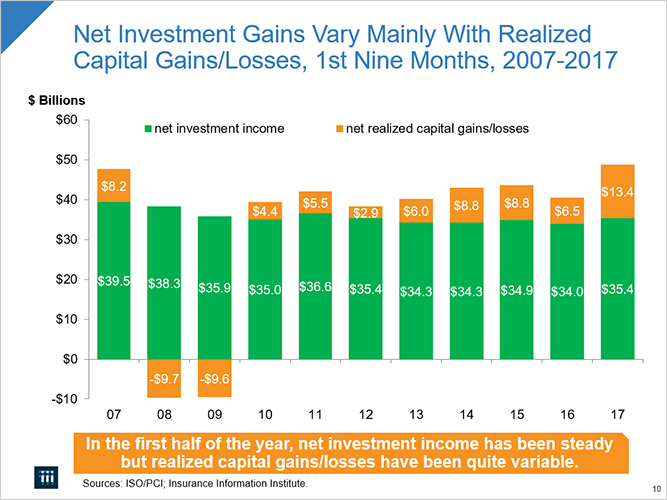 Only realized capital gains and losses affect insurer net income; unrealized capital gains and losses affect policyholders’ surplus. Unrealized capital gains from the first three quarters of 2017 were $14.7 billion, vs. $2.5 billion through the first three-quarters of 2016. This is why surplus was able to grow (see below) despite outsize claim volume, especially in the third quarter of 2017. Driven in part by unrealized capital gains, policyholders’ surplus as of September 30, 2017, stood at $719.4 billion—its highest-ever level. 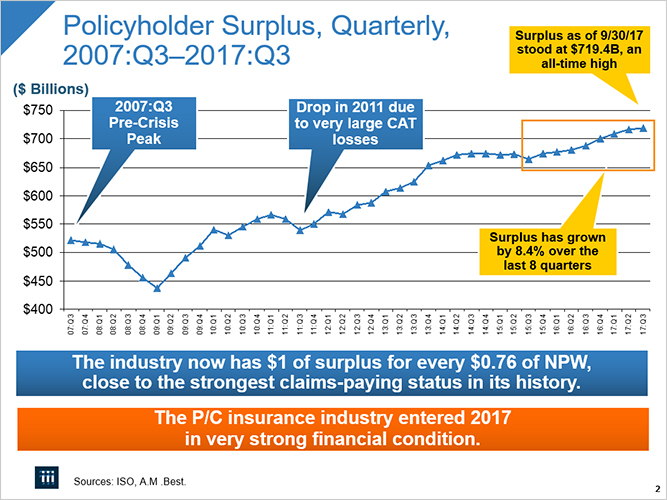 Policyholders’ surplus has generally increased in recent years as industry profits rose and as assets in the industry’s investment portfolio increased in value in the wake of the recovery from the financial crisis and Great Recession. One commonly used measure of capital adequacy, the ratio of 12-month trailing net premiums written to surplus, currently stands at 0.76, close to its strongest level in modern history. (A ratio of 1.0 is considered strong, and a lower ratio is even stronger.) The bottom line is that the industry is, and will remain, extremely well capitalized and financially prepared to pay very large scale losses in 2018 and beyond. The combined effect of lower profits and a larger capital base than a year ago produced an overall 4.2 percent rate of return on average surplus (profitability) as of the end of the first three quarters of 2017, down from 6.2 percent in the first three quarters of 2016. Policyholders’ surplus hit all-time record highs each quarter in 2017. Premium growth, while still modest, is now experiencing its longest sustained period of gains in a decade. Despite rising CAT and non-cat losses, and persistently low interest rates, the P/C insurance industry remains quite strong financially, with capital adequacy ratios remaining high relative to long-term historical averages. A detailed industry income statement for the first three quarters of 2017 follows. To view the report from ISO and PCI, click here.